There’s nothing that can’t benefit from a little spicy wallop and I especially like the idea of a cool, refreshing drink that ends in a tingly heat. 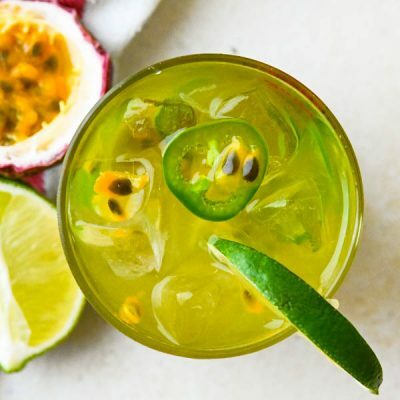 Enter the Spicy Passion Fruit Margarita. If you’re accustomed to adding a shot of tequila to a bottled margarita mix and calling it “done” you don’t know what you’re missing. 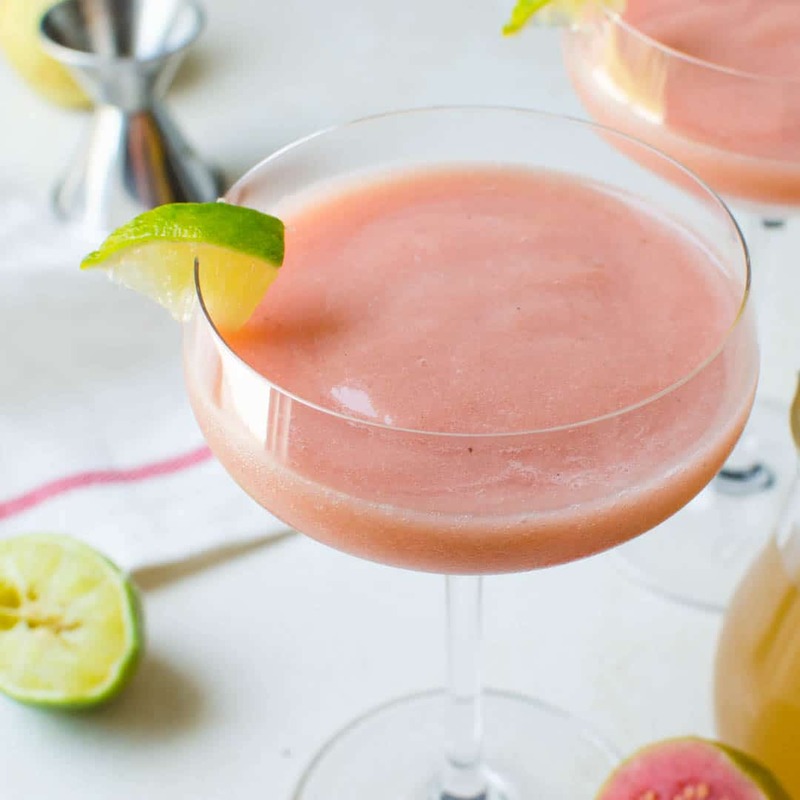 Making margaritas from scratch is nearly as simple as using the mix, however, the flavors in the homemade version are infinitely brighter, fresher and more “wow-zy”. Let’s start with the passion fruit syrup. Passion fruit has a deep, floral sweet bouquet and the flavors are like the best combination of tropical fruits in one. Passion fruit can be enjoyed straight from the wrinkly, purple pod, but to extend the life (and usefulness of this lush fruit, I like to make a passion fruit simple syrup. This syrup, with equal parts sugar and water, is infused with passion fruit pulp and steeps for a few hours to ensure a deep flavor and bright golden hue. 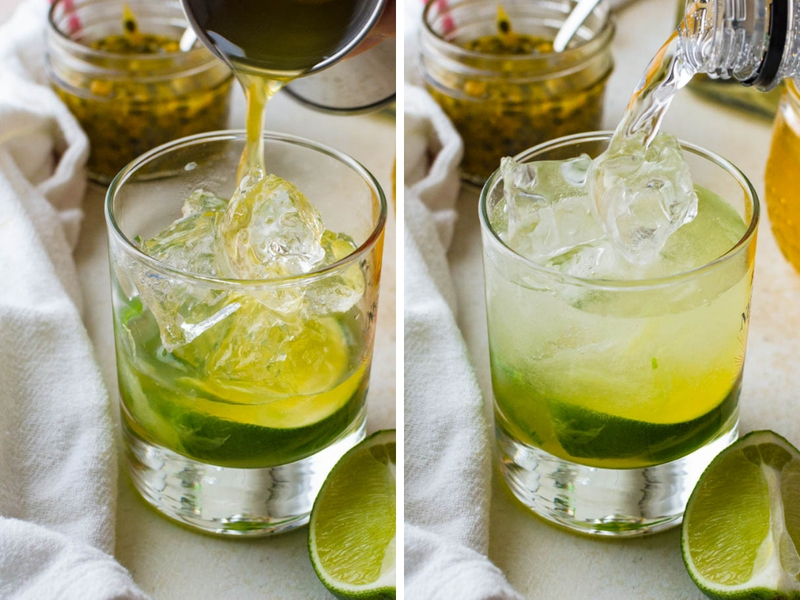 When the passion fruit is done steeping, strain it and reserve the whole pulp for garnishing your jalapeno tequila margarita. Now you’re ready to make margaritas from scratch. Place a large wedge of lime in a glass. Add several slices of jalapeno. If you just want a little heat go with 2-3 thin slices. If you like more tingle, add 4-5 slices (note: it also depends on how spicy your jalapeño is. I’ve made this several times and the heat varies by individual peppers. You might want to sample it before making these so you can adjust the heat to your tastes. Add equal parts of passion fruit simple syrup and tequila. Pour in a splash of club soda. The soda cuts the sweetness slightly and we like the bubbles! Garnish the spicy passion fruit margarita with a small spoonful of reserved passion fruit pulp, so guests get a sense of what’s in the drink. I’d like to apologize in advance for the addictive nature of these passion fruit jalapeño tequila margaritas. They are tropical, slightly sweet, a bit tangy with a bit of heat that comes at the end. 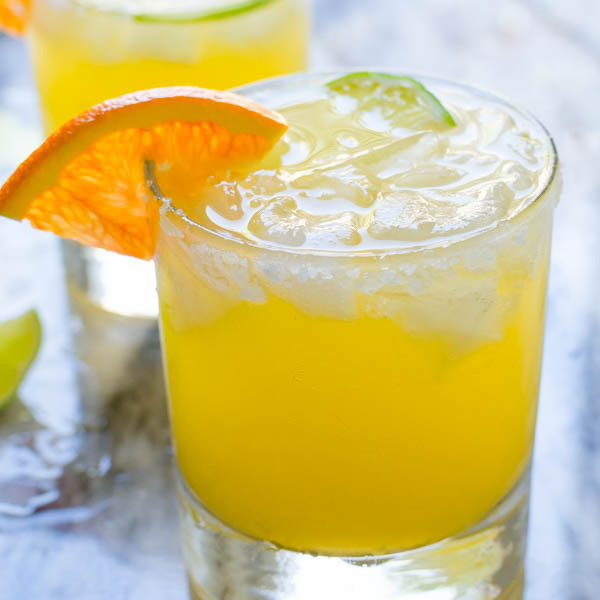 Trust me, it’s impossible to stop after just one and once you’ve shared these from scratch margs with your friends, they won’t be able to stop either. 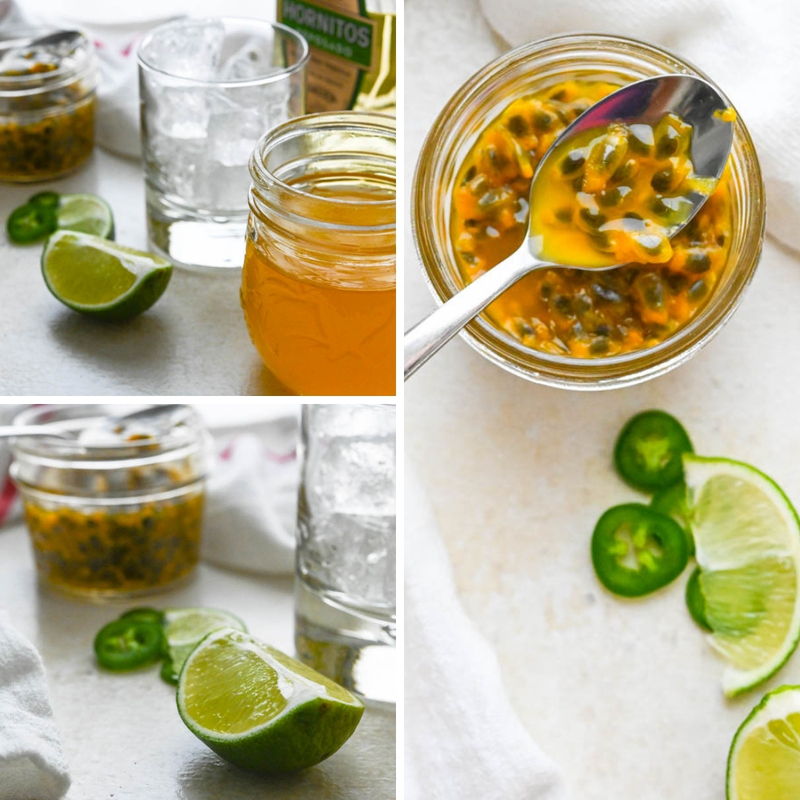 I’d advise making a big batch of that passion fruit simple syrup and keeping it on hand for all your back yard barbecues, picnics and pool parties this season. If you’re planning a week at the beach this summer, be sure you bring your muddler. You’re gonna need it! 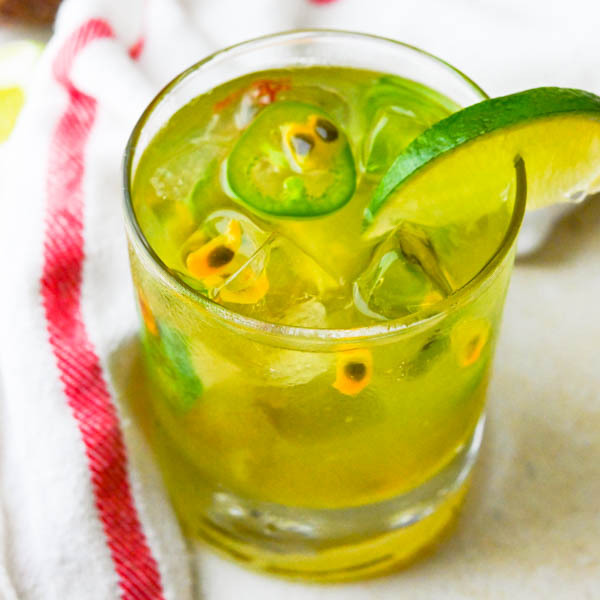 This tropical margarita gets a spicy kick from muddled jalapeño. Refreshing and tingly all at once! 4-5 slices jalapeno use more or less according to your tastes. 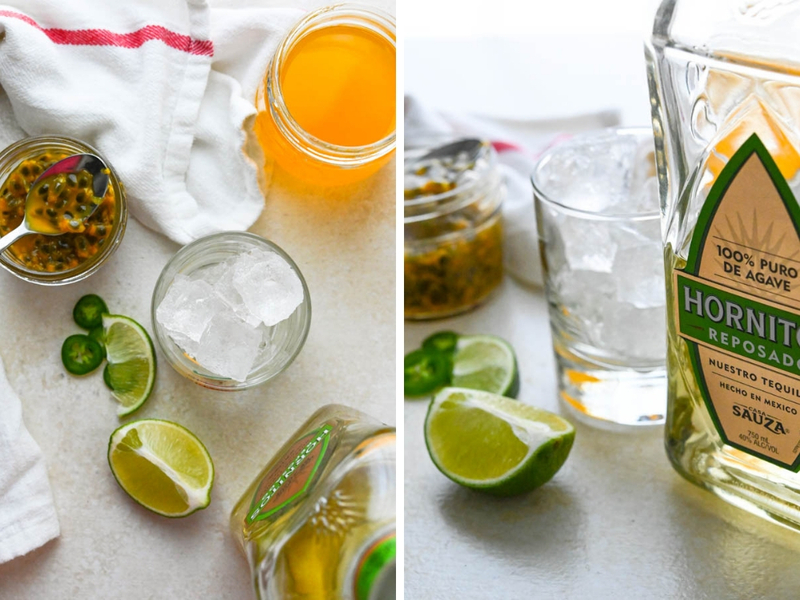 In an old fashioned glass, add the lime and jalapeno slices. 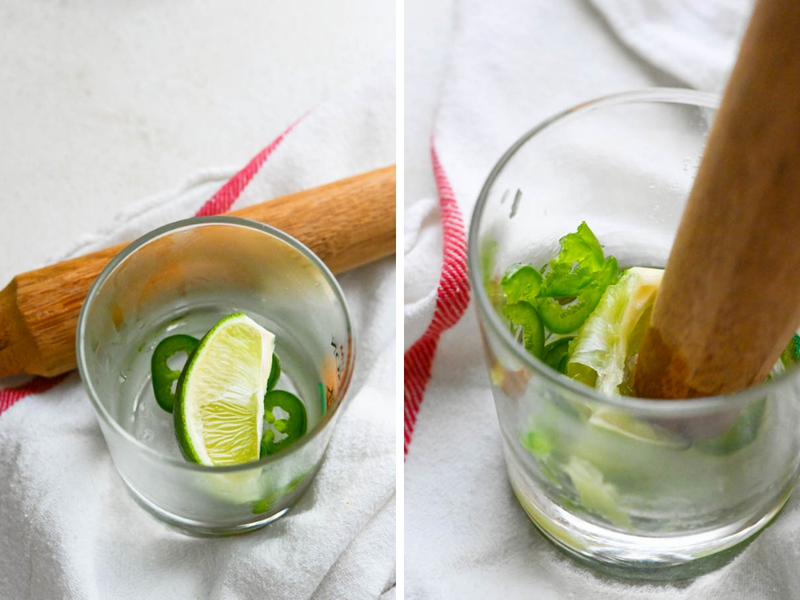 Use a muddler to smash the lime and jalapeno. Fill the glass with ice and add the passion fruit simple syrup and tequila. Mix with a spoon to combine then top with a splash of club soda. Garnish with a few passion fruit seeds and wedge of lime. Enjoy! Muddle together 5 thinly sliced jalapeños and 4 quartered limes until well mashed. 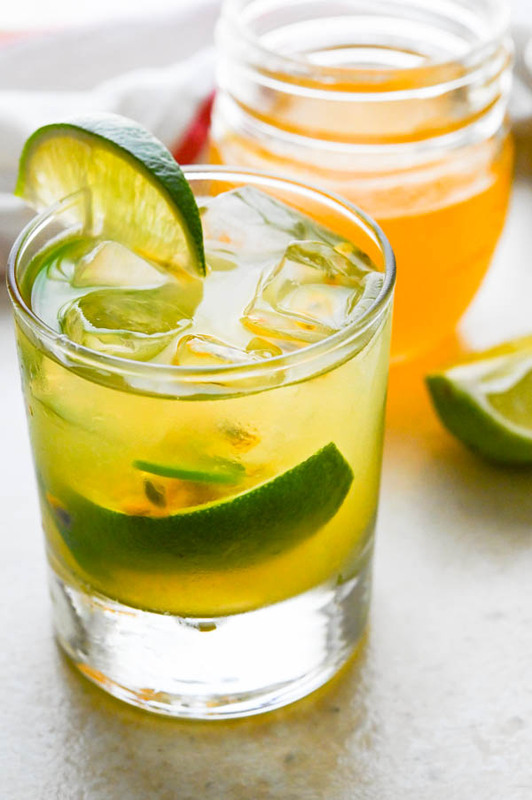 Add 2 cups of passion fruit simple syrup and 2 cups tequila in a large pitcher. Add 1/3 cup of passion fruit pulp. Stir well, cover and chill for at least two hours or until very cold. 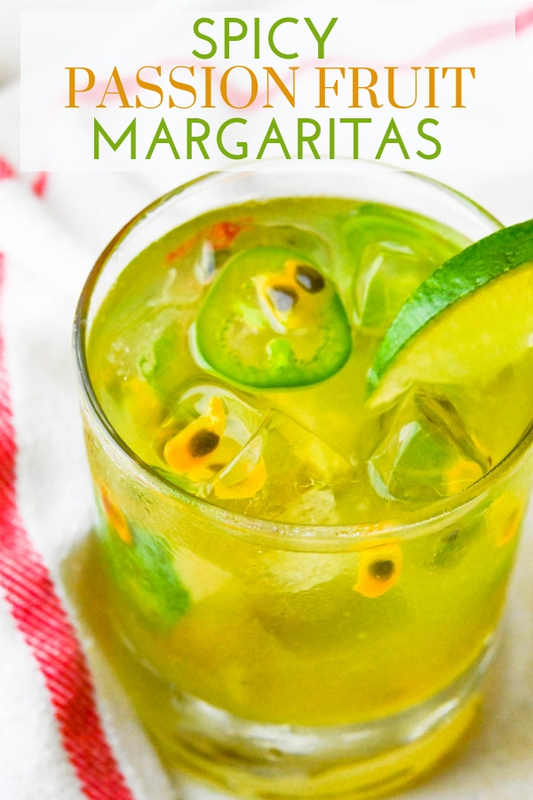 Fill individual glasses with ice and pour about two ounces of the margarita mix into the glasses. Spoon in some pulp, lime and jalapeno if desired. Top with a splash of club soda and serve. 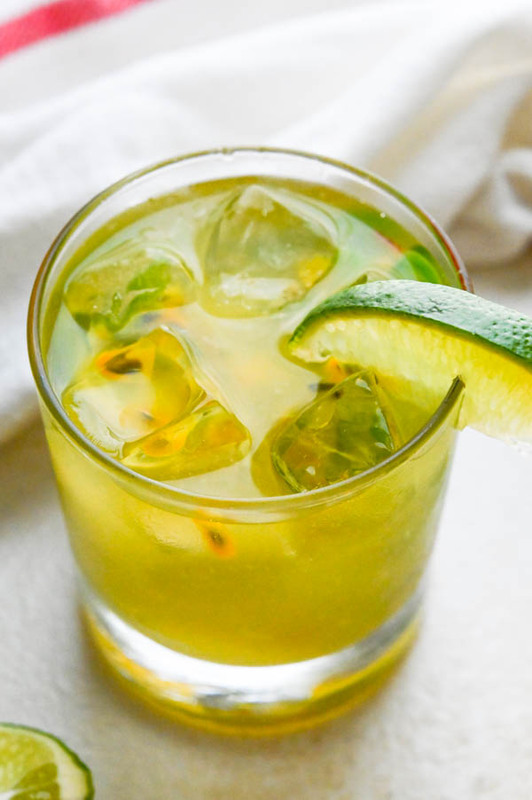 Pin “Spicy Passion Fruit Margaritas” For Later! I’m all over this! Looking forward to this frosty beverage soon! Wow! This looks great and sounds so interesting! Passion fruit cocktails are so good! Need to try! I loved it! Loved the flavor combination! 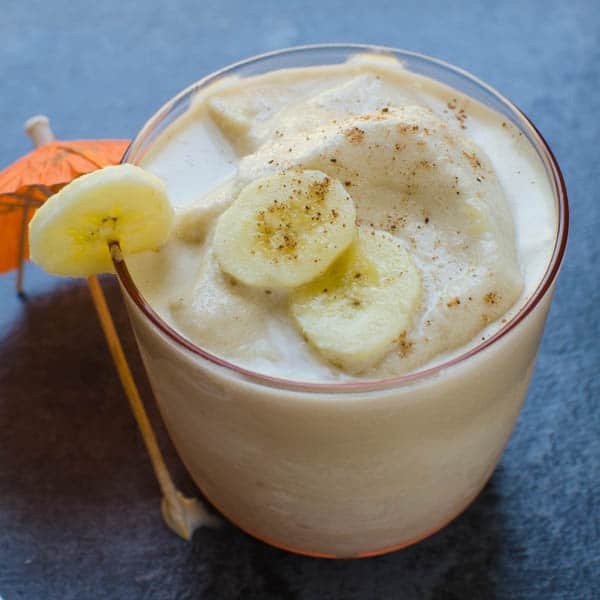 What a fun recipe – perfect for Summer time coming up! What a gorgeous, refreshing drink this is and I love those spectacular shots. Thanks for each and every post that you share, love trying the for my family. So glad you like it Meghna! The jalapeno really gives it a spicy kick! Looks so refreshing and unique! Perfect for summer cocktail parties!